Slow Cooker Baked Potatoes are the perfect side dish that you can make in your crock-pot year around. Our passion for Slow Cooker meals has been well documented here. We like making easy and restaurant quality dishes using it. 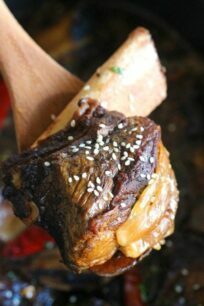 Among our most popular recipes is Asian Short Ribs, Crock Pot Sesame Chicken and Tuscan Chicken Pasta. 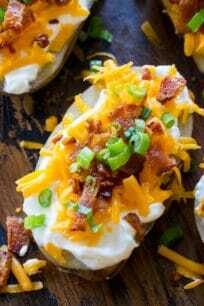 Slow Cooker Baked Potatoes are the easiest, foolproof recipe, that no one can mess up! We love potatoes, and since we got the Slow Cooker, making baked potatoes became a tradition in our house. The recipe for this dish involves a few simple steps. 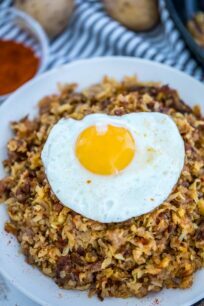 This homemade dish is best cooked on low, for 7-8 hours in the crock-pot. 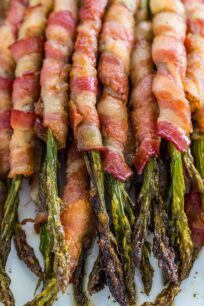 I like to quickly add them to my crockpot before I go to work, and at dinnertime, my husband just grills a steak or chicken and we have a rounded, delicious meal. Easy like that! I love my Crockpot – this one is so reasonably priced! Make sure to pierce the potatoes, at least 4 times on each side. Rub them in olive oil, salt, and pepper. Cook them on low, not on the high setting, I like the results more on low. Once done, unwrap a potato, check if done, and if needed, cook for an extra hour just until tender. 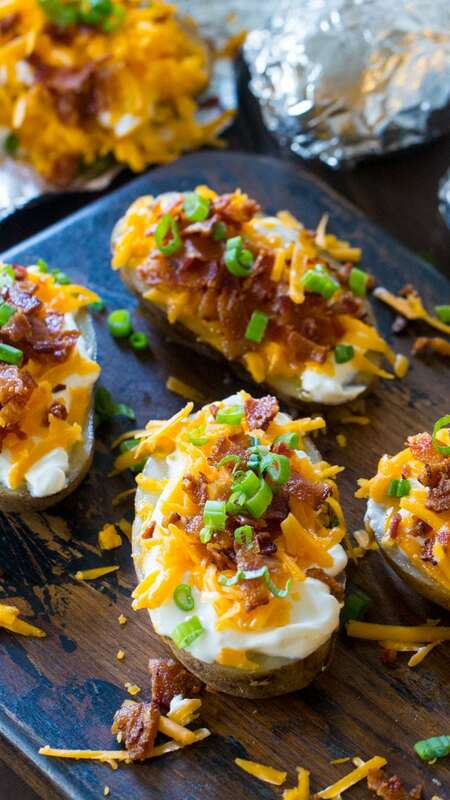 How to make the best Slow Cooker Baked Potatoes? First, pierce the potatoes with a fork several times on al the sides. Then, rub potatoes well with olive oil and sprinkle with salt. Lastly, place the potatoes into the crock pot, cover, and cook on Low for 7 to 8 hours or until tender. Please note, the cooking time in the crockpot will vary based on the size of the potatoes you use. As a general rule, we use 2.5-3 hours on high or 7-8 hours on low. However, this might vary if the potatoes are smaller, so it is best to test them with a fork for doneness. 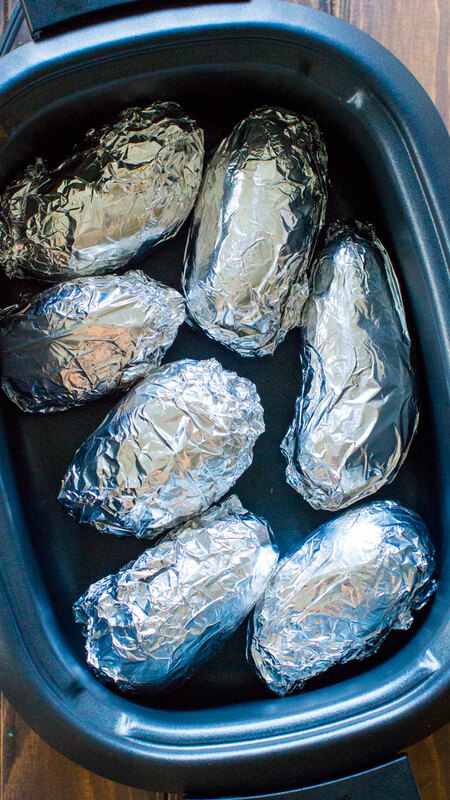 Can you use aluminum foil in a crock-pot? Using aluminum foil is actually very convenient when cooking something in the crock-pot. Firstly, it will make it easier to clean the dish. Also, it will help the food cook more uniformly and evenly. Simply, wrap the food in foil, and place it in the crock-pot. It will result in a delicious and tasty dish. As a general rule, you want to use starchy potatoes when baking. The best ones for baking would be Yukon Gold and Russets potatoes, as they have the most starch in them. WHAT IS THE MOST NUTRITIOUS PART OF A POTATO? I always recommend using organic potatoes when cooking, since they contain way fewer chemicals, and are safe to eat with skin-on. That being said, potato skin contains significant nutrients. Similarly, the flesh is healthy and has good nutrients. Potatoes are a rich source of fiber, iron, vitamin C and vitamin B-6, but to get the most nutrients you’ll need to eat the whole potato. Easy Slow Cooker Baked Potatoes are the perfect side dish that you can make in your crock-pot year around. Seriously, its the easiest recipe you will ever make! Pierce the potatoes with a fork several times on al the sides. Rub potatoes well with olive oil and sprinkle with salt. Place the potatoes into the crock pot, cover, and cook on Low for 7 1/2 to 8 hours or until tender. Baked potatoes can be tricky to cook, so I’m definitely trying this easy method! I need to try this for our next Sunday dinner. 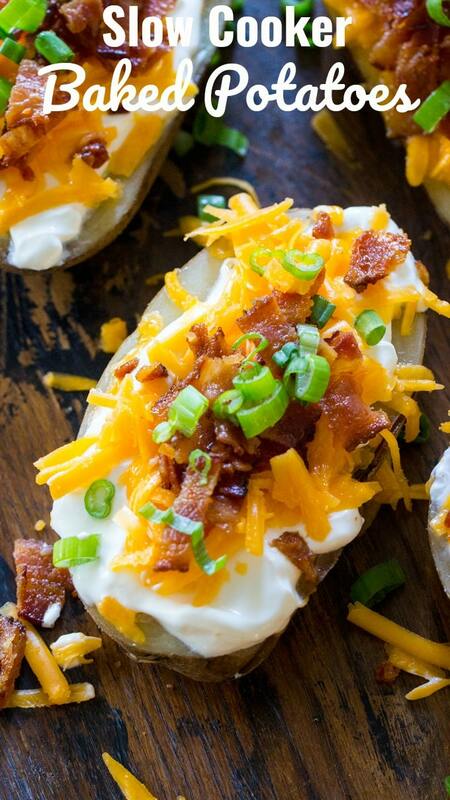 The boys always want baked potatoes so this would make it so much easier! I’m definitely trying this. I love baked potatoes and we don’t have them that often because I rarely have the time to cook them in the oven. Gorgeous photos! I want to reach out and grab one off the screen right now! Such an easy fool proof way to make baked potatoes!